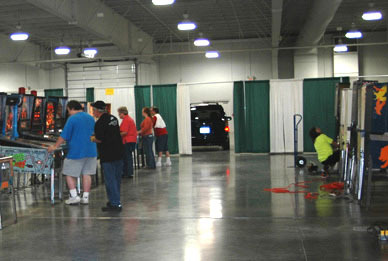 Location: KCI Expo Center, 11730 North Ambassador Drive, Kansas City, Missouri, USA. 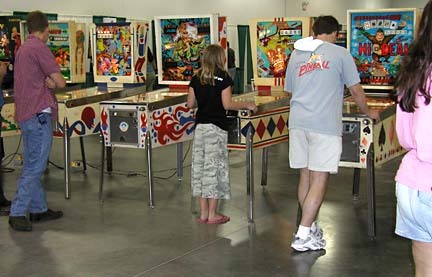 The Kansas City FlipFest pinball show was held from June 9th through June 11th, 2006. 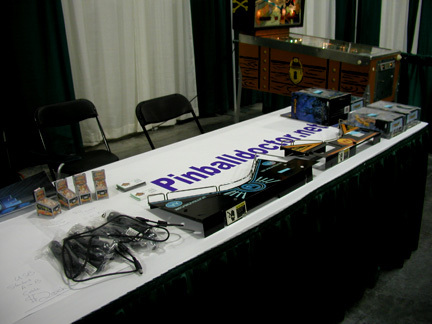 The organizers wanted to have a local show that would promote pinball and allow local venders and collectors to display their games. 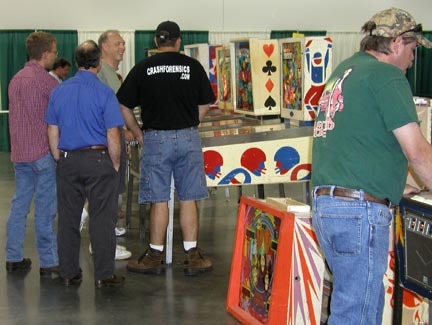 They were unaware of any previous attempts to produce a Kansas City pinball show. Initially, they were just dreaming, but could they really do it? In a previous life my employer held a conference every year with about 1,000 attendees and although I was only a gofer and the general format was the same each year, I could tell that it took a whole lot of work and cooperation from a lot of people to make a good production. Sometimes, as targeted dates came closer, co-workers who usually worked well together, were at each other's throats, almost like Homer and Bart Simpson. 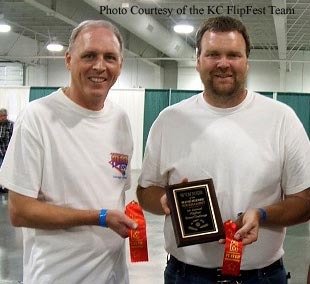 The organizers of the KC FlipFest are husbands and wives and friends and I'm sure they were sometimes ready to strangle each other too but, this group found a way to make it through the rough decision-making processes and made the show a success from the beginning! 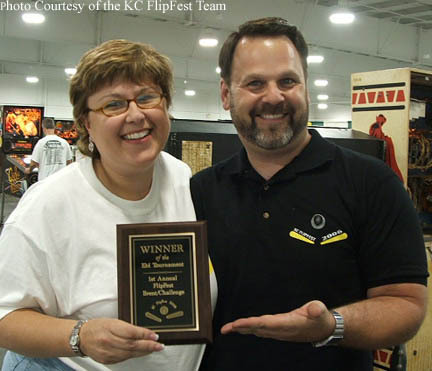 Nine or ten months before the opening of their show (while the show was still in the dream stage), the organizers met with Cheryl Thorp and Jennifer Goering of the Platte County Missouri Visitor's Bureau. 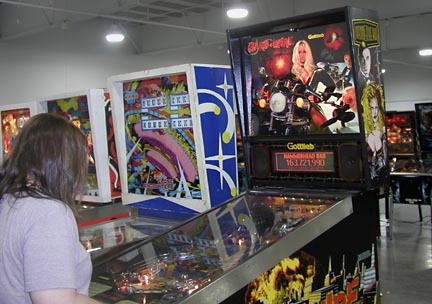 The Visitor's Bureau became interested in helping the pinball group to bring visitors to the area. Thorp and Goering suggested that the group contact the Kansas City Neighborhood Tourist Development Fund about the possibility of receiving grant ($) assistance. Organizers were interested but they had no experience asking for grant money. The Visitor's Bureau agreed to help write and present the grant proposal to the Kansas City Neighborhood Tourist Development Fund. 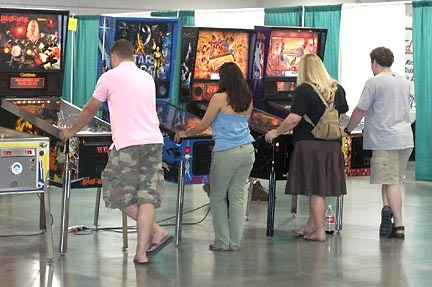 Because of those efforts, the FlipFest team received $7500 to help them make the pinball show possible. 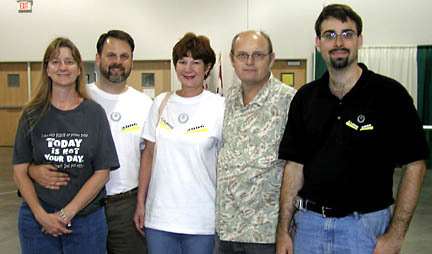 Becky and Doug Grant, Elva and Vern Winsor, and Curt Laven. 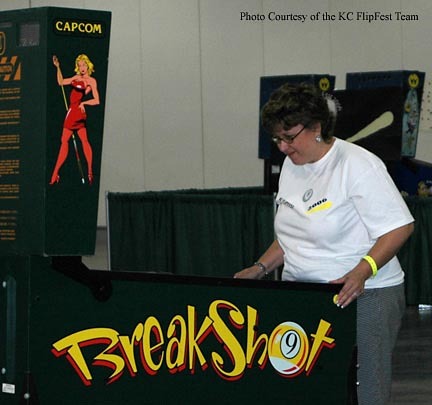 Vern Winsor mentioned that a local friend, Don Brownback helped quite a bit by calling other friends and vendors to generate interest and to secure promises of games for the show. Vern said that you need different types of people to put on a show, dreamers, organizers, and workers. He also stressed that you need someone that is comfortable being interviewed by the media. 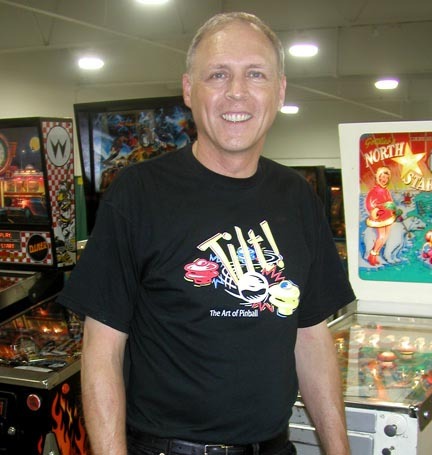 Doug Grant noted that Bob Herbison of the Texas Pinball Festival came to Kansas City to help out the FlipFest Team during the show. 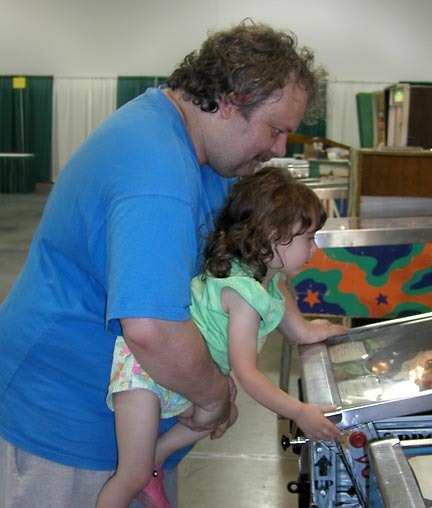 Doug said Bob had many helpful suggestions and even grabbed a dolly and helped people unload their games! The Platte County Missouri Visitor's Bureau stationed greeters just outside the entrance to the FlipFest. They had a variety of brochures about local attractions and were ready to answer visitors' questions. 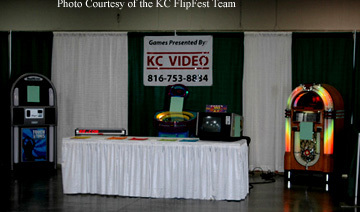 Vendors and other people unloading their games were pleased with the KCI Expo Center facility. 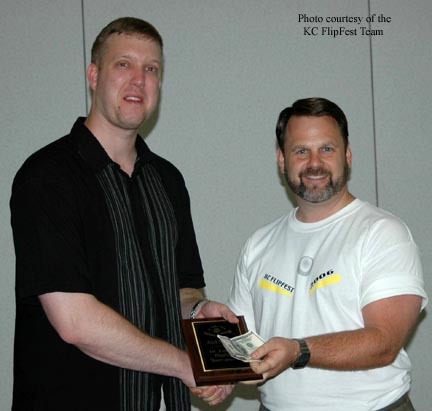 It's located near the Kansas City International Airport (KCI) and two Interstate highways. People bringing machines were allowed to drive in to the facility through opened overhead doors and unload in air conditioned comfort. 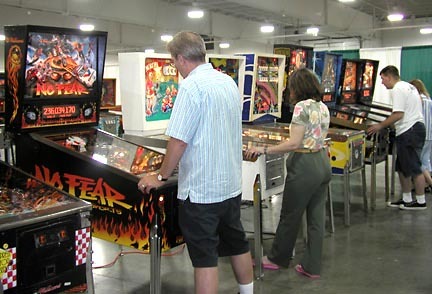 The FlipFest secured 10,000 square feet of space for the show and I think it was just the right size for the number of games and booths that they had set up. Grant said that more space is available if the need arises next year. I'm guessing they'll need more space. Grant also said the Team spent money upgrading the facility's power supply so it could handle all of the games and equipment. The spinning text was deleted from the final version to save money. The Team also did several interviews with local newspapers and handed out flyers from time to time. Doug Grant mentioned that the flyers were a good idea except for the litter bugs! One person called them to complain that people took the flyers off their windshields and threw them on his parking lot. Grant also reported that the television commercials generated a lot of positive telephone calls about the show. 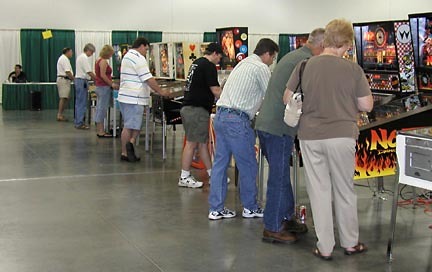 Interest telephone calls were also generated after the airing of a local television station's visit to the show. The station brought their cameras and interviewed several people. 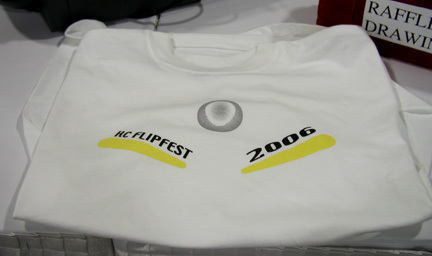 For next year's show, the FlipFest Team would like to expand their advertising coverage area. Grant reported that they will work to target more cities (outside the metropolitan Kansas City area) and larger areas. Screen shot of the 30 second commercial. 2 lines of text are blurred because they were spinning. Although most of the approximately 300 attendees were from the greater Kansas City area, people came from other Kansas and Missouri cities as well as from the states of Illinois, Texas, Virginia, Minnesota, Ohio, and California. Our travel time was about 5 hours one way by car from Washington, Missouri (near St. Louis). Illinois drivers might have spent around 8 hours in their vehicles or took a plane. I'd guess that attendees from other states flew to Kansas City, unless they had other reasons for driving to the event. For those unfamiliar with our geography here in the USA, California is about 1500 miles form Kansas City, Virginia about 1,000 miles, Minnesota and Texas about 400 - 500 miles, Ohio about 600 miles. 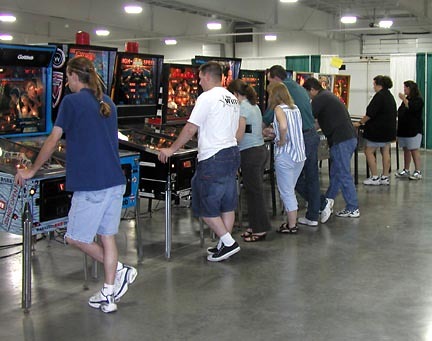 Those people made quite an investment to attend a "first time" pinball show but, based on random comments, I'd say they were pleased they made the trip. 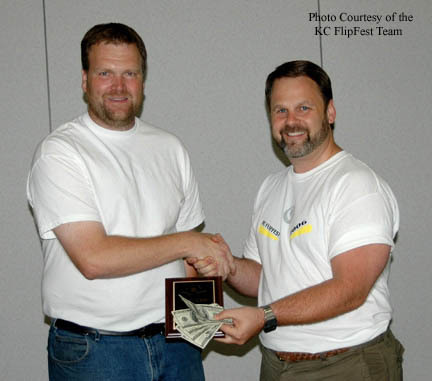 Deciding whether to buy another raffle ticket? 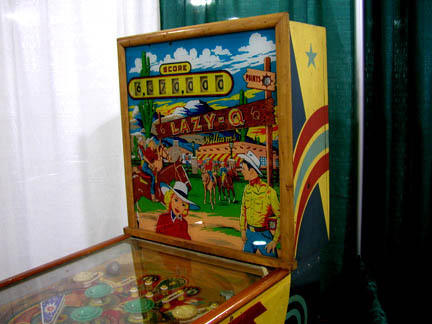 This 1970 Bally El Toro pinball was available for the price of a raffle ticket. It played pretty well but it needed a little work. We bought 6 tickets and were certain that we'd be taking it home, well, at least I was certain. 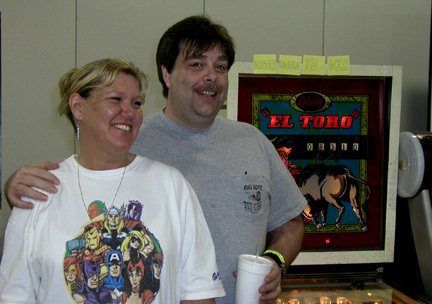 Barbara and Earl Yoweel of St. Louis, Missouri, El Toro raffle winners. Earl said he now has 7-1/2 pinball machines. 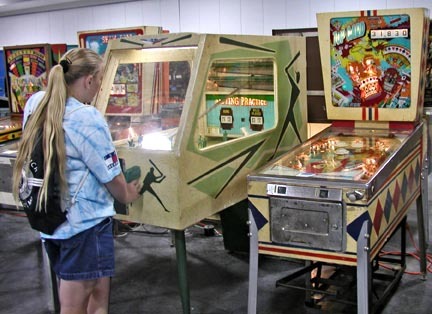 The EM tournament was played on a Bally 1975 Hi Deal. The winning score was 163,010 points! 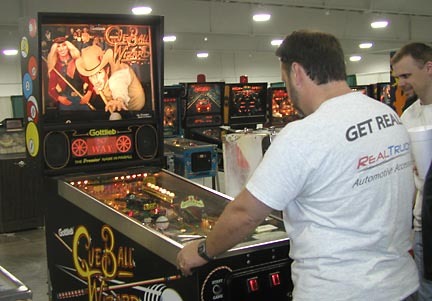 The women's tournament was played on Cue Ball Wizard, Gottlieb/Premier, 1992. 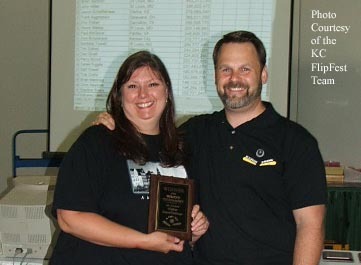 The winning score was 92,021,160 points! 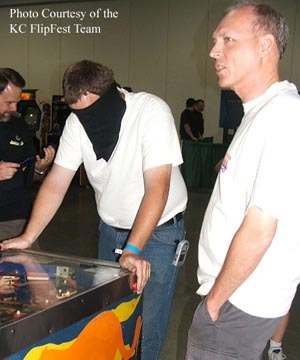 The blindfolded tournament was played on a Bally 1980 Frontier pinball machine. Other than individual interests in the other tournaments, the raffle, etc., this was the most exciting part of the show! 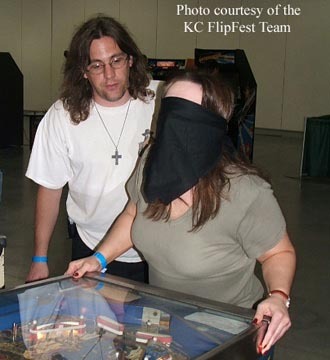 As the title suggests, the player was blindfolded. 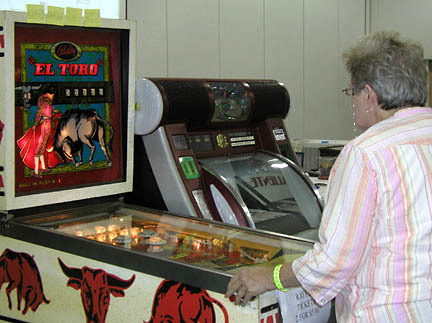 The 'seeing' partner was allowed to describe the action and tell the player when to flip and which flipper to use. Actually, my wife and I didn't get to see it (no pun intended - we left for supper, sorry I was hungry!) people that did see it thought it was great! They reported laughing out loud watching teams of one blindfolded player TRYING to play a game while being coached by a non-blindfolded partner. The coach would yell, sometimes SCREAM, flip, left, no right flip, no, yes, FLIP!! After a game was finished the partners switched. 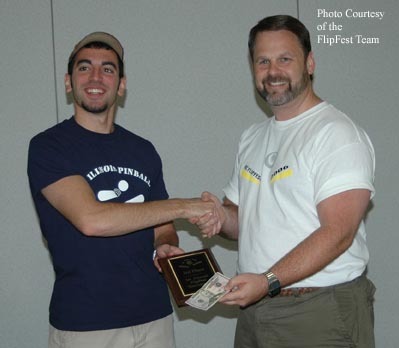 Scores were combined for a total high score. Next time I'll be sure to be present, might even enter, it sounds like it was a lot of fun. How'd they win with Mike looking out into space? and Don Brownback, Basehor, Kansas. They tallied 927,180 points! I thought the main tournament was different than others that I'd seen, although I'm no expert in this area. About 150 qualifying entry tickets were sold, 2 plays for $5.00, no limit to the number of entries you could buy. 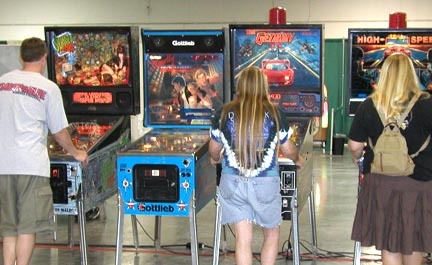 Players qualified on 4 Williams' Whitewater machines donated for use by Keller Pinball Restorations. 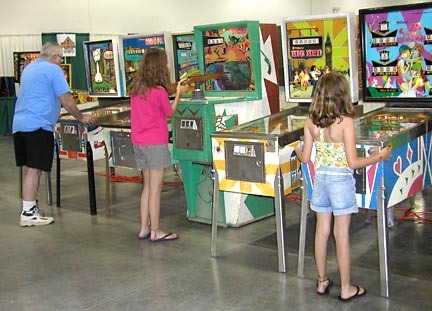 The highest 16 qualifying scores moved on to the final round that involved 6 different pinball games. The usual tournament rules, tilt, stuck ball, bang-back, slam-tilts, etc applied. The 16 players were put into groups of 2. 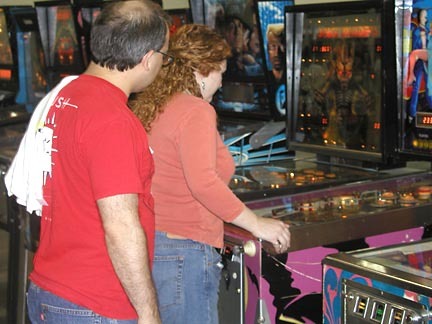 Those 2 would play the same machine but the higher qualifying person of the 2 got to choose either the game or who would play first. Naturally, high scores prevailed. 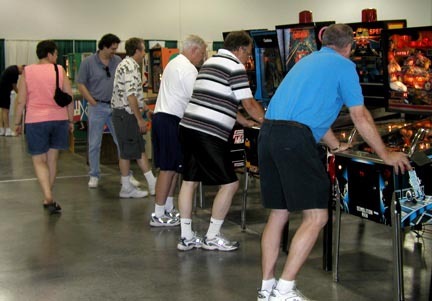 Doug Grant reported that they had some trouble with some of the tournament machines but Vern Winsor, with the help of Trent Augenstein from Delaware, Ohio, nursed the broken games back to health as needed. Grant also noted that the tournament players were 'the absolute best' because they were were understanding, helpful and patient. 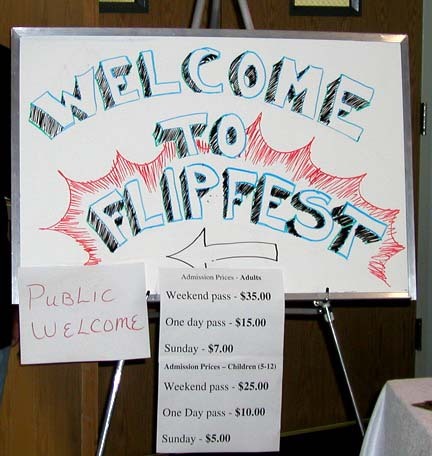 Here's a high-tech note: The tournament was 'streamed' live to the FlipFest web site. Cool, I don't know if others have done that! thanks to John Lundberg for pointing that out! enjoying a Break Shot game after her win. That shirt makes this guy pretty cool, don't ya' think? 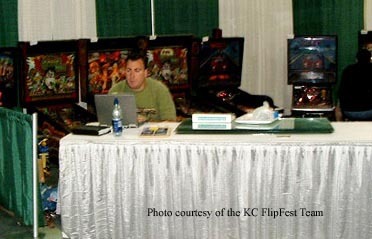 My wife and I both thought the KC FlipFest Team produced a wonderful, pinball show. This was their first attempt and a few features did not materialize. Vendor turnout could have been better. There wasn't enough interest in the kids tournament. Speakers and seminars were advertised in the show's flyer but they didn't happen. Organizers reported that they had commitments from people but they had to cancel their appearances. They suggest that back-up speakers would be a good idea for future shows.Also, a scheduled swap meet didn't happen. 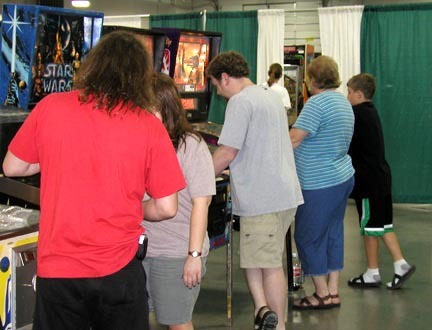 I think all of these small problems were due to a first time attempt and I'd guess, because of the many successes of the show, that next year more players, vendors, and collectors will be at Flipfest 2007.